1. Know where your pipes are as you can puncture a plastic or copper supply or drain when banging in nails or screwing in screws. Purchase a stud finder that will detect pipes and wires. 2. 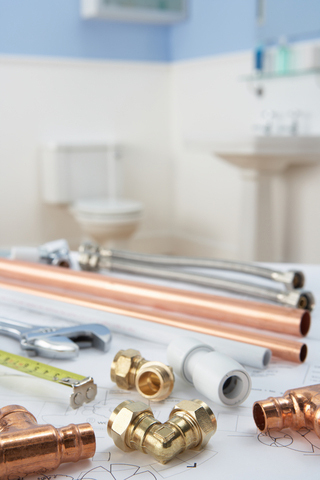 Most people think more is better but when it comes to tightening pipes, especially brass or copper fittings, you can damage the fitting with over tightening. If the joints are properly cut and fitted and sealed, hand tighten or with a wrench another half turn is usually all that is needed. 3. If your showerhead is exhibiting slow or erratic water pressure, it could be a sign of mineral buildup. To get the water flowing again, use a pin to clean outlet holes or unscrew the faceplate, soak it in vinager then scrub it clean. 4. When working on any faucet fixtures with a wrench, tape wrap the wrench's jaws to prevent marring and damage to the parts that are in view. 5. Before beginning any work, make sure that you turn off the water at the main shut off valve or at the fixture shut off valves then open faucets so that the pipes can drain. 6. One of the most common clogs is a kitchen drain. To help avoid this do not throw grease or coffee grinds down the drain. 7. If you have metal pipes, be careful using chemical cleaners as some chemicals can corrode metal pipes. 8. If you are remodeling and have the walls stripped down, take a picture of inside so that after the remodeling job is over you will still know where the electrical, plumbing and framing are. Take pictures of under the floors and ceiling too.